Allegations against Mrs Yang escalate. If you have not read the investigative report and Mrs Yang’s response – please feel free to read them HERE. Within days of the ‘investigation’ into Mrs Yang appearing, another article appeared in the New York Times ‘sinosphere blog’, written by Shaojie Huang, who is the Senior Editor at the New York Times Chinese. While you can click on the link below to read the article and click on live links within the article, we have also uploaded screen shots at the end of this post. This article appeared on September 22nd and has certainly been doing the ’rounds of social media’, especially with the ardent NTDM supporters who have been citing this as ‘proof’ that Mrs Yang is in fact an ‘animal abuser’! Here are just a couple of those posts, should you find it rather unbelievable. It seems supporters of the charity appear to have information that nobody else does, including Mr Brett Allan who clearly states below that he is very involved with the charity and could be a trustee but can’t commit to the job fully. Meanwhile, while the CEO has repeatedly stated that none of the social media accounts speak on behalf of the charity, she allows the supporters to say whatever they like with no recourse. Not the best use of social media for a global charity in our humble opinion. Mrs Yang has a ‘gang of thugs’? Mrs Yang known to sell to meat traders? Mrs Yang an animal hoarder? What is the agenda behind all of this? Where, when and how much money was raised during the ‘Televised Fundraiser’, and who initiated it. No link to the ‘open letter’ by dozens of groups. Mr Chen has known Mrs Yang for more than a decade, yet only NOW questions her? Did you not feel the need to ask him why he has waited so long? How can anyone count hundreds of dogs running around and then come up with a figure of 300 – 400? Which shelter was this count obtained from? No amounts shown of funds transferred by the Charity, which considering the ongoing debates on exact totals would have gone a long way to clarify exactly how much Mrs Yang is supposed to have received. While it may have taken a while to get both sides in agreement on totals, this surely should have been a priority. Anonymous sources, while acknowledged, rarely carry much weight as they are free to say whatever they like. With so many concerned groups involved surely a few of those would have been more than happy to speak on the record? Why did the charity CEO and Trustee feel the need to make an ‘unannounced visit’ to the beneficiary of their huge fundraiser, yet managed to somehow let other activists know exactly when they would arrive at Mrs Yang’s so they too could turn up ‘unannounced’? (See videos previously posted). According to the charity they were already in close contact with Mrs Yang and her family. Like many other articles, this one also alludes to dog numbers – be they current, totals over several years, or even several decades. Even the Charity fundraiser states that she has rescued 6,000 dogs over 20 years. Mrs Yang should have been asked and it made clear exactly how many dogs she has now, rescued this year and any other relevant detail. While there are more questions than answers, yet again, regarding Mrs Yang’s fundraiser and what appears to be a now public attack on her, we still await the Official Report, and the Press Conference from the Charity CEO which may or may not confirm the serious allegations made against Mrs Yang. We hope Mrs Yang is consulted prior to its release in order to respond. Three days later however, Mr Li did share the article on his personal page and spoke of being shocked! Also in a personal capacity he commented on a page set up on Facebook called “STOP Dog Charity Fraud” back on September 6th and 7th. Of course Mr Li has every right to comment on anything as an individual, but as he is actually working for Humane Society International and having known about these ‘shocking revelations’ back in early September, we would have expected to see comments accordingly in the September 22nd article. Mr Li is no newcomer to the goings on surrounding the dog meat trade in China, as can be seen from another article published in June 2015 stating that he has studied and written about animal protection and wildlife conservation in China for the past 15 years. Indeed the article goes on to share a Q & A session with Mr Li specifically relating to the Yulin Dog Meat Festival, conditions of dogs rescued from the trucks and of his meetings with the meat traders and slaughterhouses themselves. How does Mr Li know that “NTDM” is not the first donor if he and/or HSI have never actually investigated her – if indeed she needs to be investigated at all? In a country as huge as China, why has Mr Li, like others, only now felt the need to speak out and for some reason only targeting Mrs Yang? Surely there are hundreds, if not thousands of ‘rescues’ and ‘shelters’ doing exactly the same thing over the last decade or two that should also have been under the same scrutiny. For example, back in 2014 ANOTHER ‘Aunty Yang’ (Yang Hu Hua) of Yang Hu Hua shelter in Chongqing was rescuing dogs from Yulin. Hand In Hand With Asia’s Animal Activists raised and sent funds to assist this other “Aunty Yang”, but when the shelter was inspected by Ruby Animal Rescue (China), dogs were found to be permanently incarcerated in stacked cages– something that is known as ‘warehousing’ a practice quite common with hoarders that slowly drives the dogs mad. So in fact terrible conditions and shelter practices were happening in Chongqing as recently as July 2014, yet for some reason Mr Li and his organization did not deem it necessary to investigate this rescuer? So one wonders who the ‘international organizations’ referred to below were. Sadly Ruby Animal Rescue changed their organization’s name and the blog post appears to have been lost in this transition. We also noticed the Yang Hu Hua shelter is located in Chongqing, as is one of the signatories on the ‘Mrs Yang Investigation Report’ – namely Chen Mincai of Chongqing Small Animal Protection Association. Why did this association not feel the need to investigate a shelter that clearly turned out to be a hoarding situation back in 2014? 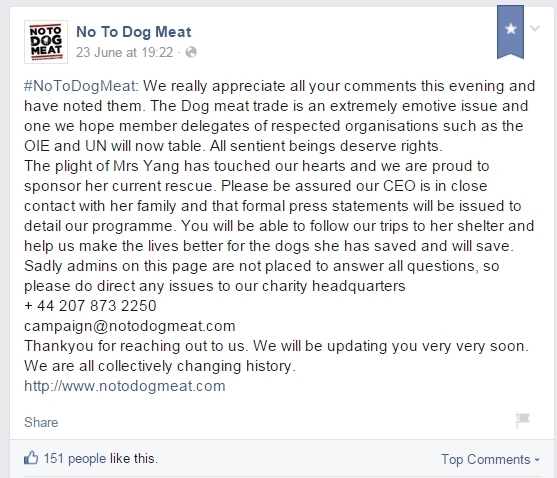 Yang is a Scam – appears to have been set up on September 8th 2015 – this page also ‘likes’ Stop Dog Charity Fraud and We Care by some strange coincidence. We note that the above page has not posted anything new in recent weeks and feel this is possibly due to the admin of the page having had his account suspended awaiting verification of his identity. Do you not find this totally bizarre? We leave our readers to make up their own minds about what is really going on regarding Mrs Yang, the Fundraiser for her (which has now had funds suspended by the Charity) and the sudden emergence of pages seemingly dedicated to discrediting her.